In Tell Them of Battles, Kings and Elephants (translated by Charlotte Mandell, review copy courtesy of Fitzcarraldo Editions), we find ourselves in 1506, where a certain Michelangelo Buonarroti has just arrived in Istanbul. Having fled from Rome after a disagreement with the current Pope, the sculptor has taken on a commission from the Turkish Sultan to design a bridge across the Bosphorus, a structure that is to cement his fame for good. As he wanders around the foreign city, adjusting to the sights and sounds of the metropolis, he wonders just how he is to come up with a concept worthy of the task. While waiting for inspiration to strike, our Italian friend is shown another side to his temporary home. Even in a Muslim city, there is plenty to entertain the Christian visitor, and his new friend Mesihi, a poet with a liking for the finer things in life, is happy to show them to him. When the pair end up drinking at a recitation, Michelangelo is captivated by the singer, a beautiful androgynous figure dispensing both wine and heart-rending songs. It is this alluring vision that is to inspire him to finally design his bridge – but this stranger also represents all that is dangerous in this new world. Quite apart from gazing upon the two shores he is to connect, he visits the markets selling slaves and animals alike (including elephants!). With a proliferation of merchants from around the Mediterranean, though, it’s actually more homelike than he might have imagined. The Turkish capital is a city of contrasts, and the tolerance shown towards the Christian population comes as a welcome surprise. We start to wonder which of the two is more eager for the night to go on. The dancer is to act as a muse, but one the Italian artist must handle very carefully. This is a realisation he has already come to independently, but it’s not just the Pope’s dismissive behaviour that leads him to this conclusion. The longer he stays in Turkey, the more he is angered by what he sees as his shoddy treatment at the hands of the Sultan and his minions. Another aspect of the novel that becomes increasingly fascinating is the relationship Michelangelo develops with Mesihi. It’s clear early on that the poet has more than a mere platonic interest in the Italian visitor, even if Michelangelo himself seems unaware of this, and Mesihi does all he can to indulge his new friend, even to the extent of enabling his nocturnal adventures. By the end of the book, the Italian has caught on to Mesihi’s feelings, and the friendship the two develop is one that seemed impossible when Michelangelo first arrived, flinching from the differences between his home and the Muslim environment he finds himself in. In terms of structure, the novel consists of short sections, often just a page or two each, featuring a mix of present tense descriptions, past tense commentary, the woman’s monologues and even brief letters from Michelangelo to his friends and family back in Italy (as we find out later, these are real, translated by Énard himself). It’s a varied collection of texts, but together they work very well. 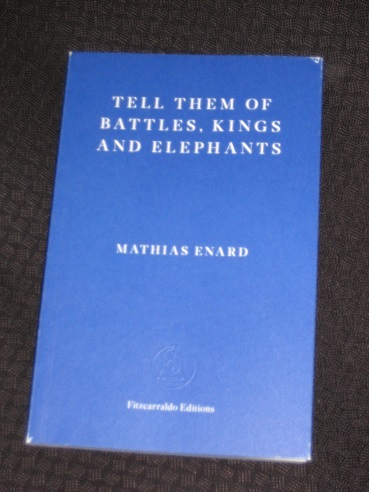 Most importantly, as is always the case with Énard, Tell Them of Battles… is a pleasure to read. Having polished the book off in an evening, I went through it again more slowly a couple of weeks later, and I enjoyed it just as much the second time around. Knowing the book’s secrets, I was able to see events in a different light, and it made for another absorbing reading experience. This one may not be quite as hefty or dense as some of his earlier books, but that’s not to say it’s any less impressive. I suspect this is another work that will feature on many recommendation lists in the months to come. I think your point that Enard is a pleasure to read is spot on. I hope this shorter book allows more people to realise this!